If you follow me on Instagram Stories, you probably recognize this bowl… I’ve eaten some version of it several times a week for the last month. In fact, you could say I’m obsessed with them them. I love these sweet potato bowls because they are super quick and easy, and so nourishing.. not just from a nutrient standpoint (but there are plenty of those!) but also because it is warm and cozy, and totally satisfying! As in, I’m not hungry an hour later and it powers me through the day! I’ve received so many comments and questions about how I make the Sweet Potato Bowls that I decided to write a “recipe”. Recipe is in quotes, because it is a basic recipe that I follow but each bowl is different depending on what I have in my fridge. 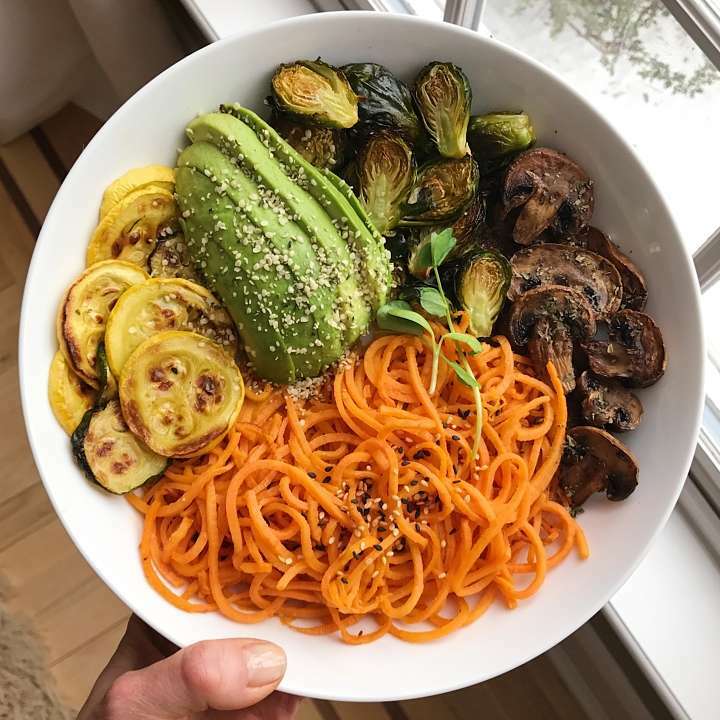 The details of this one: Roasted Zucchini and Squash, Roasted Brussel Sprouts, Roasted Basil Mushrooms and quick sautéed Spiralized Sweet Potato Noodles. I purchase the sweet potatoes already spiralized (these were from Whole Foods, but so many of the stores have them), saute them with just a little bit of olive oil, and season them with Pink Himalayan salt, and lots of sesame seeds for crunch. I tend to have roasted veggies in my fridge so this becomes a really quick lunch… sometimes, I’ll eat the veggies cold, sometimes I’ll quickly sauté them after the noodles if I want to have them warm and extra crispy. In a medium skillet, heat olive oil over medium heat. (You don't want too much oil or the noodles get soggy). When the oil is hot, place sweet potatoes in the pan and sauté for 5 -10 minutes (depending on size of noodles - thinner ones, 5 minutes, thicker ones 10 minutes), stirring periodically so they don't stick to pan. Just before taking out, sprinkle with Salt, and add in sesame seeds and stir to combine. NOTE: If using roasted veggies from another day, feel free to eat the veggies room temperature or after the sweet potatoes are warmed, use the same skillet to heat up the roasted veggies. I find that pan sautéing them for 5 minutes warms them and makes them crispy.